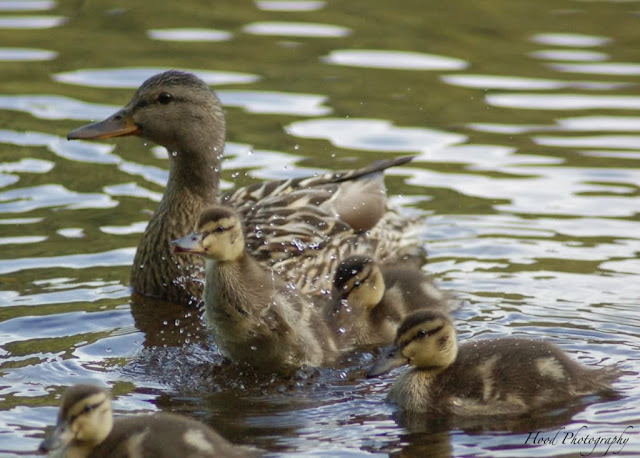 When we go up to our favorite lake on Mt Hood (Trillium Lake), there are always a lot of mother ducks with their babies. Its kinda fun to see them grow. We go up often enough that we are able to really follow how big they are all getting. The last time we went about 2 weeks ago, these older ducklings still had all their fuzz, but were getting almost big enough to start growing feathers. The one in the middle by his mom was very excited to see us, and wiggled his little body and wings for me at just the right moment! I was at Trillium Lake this past weekend...I think I saw this family of ducks, just a little bit bigger :) I have some photos posted of our weekend trip. Hope you'll check them out. They are so cute, delightful shot. What a great photo! They are all so cute! Super shot of the ducks. Thanks for pointing out the heart shaped cloud on my post. How adorable!!! So sweet. Great pic too!! Oh my goodness, I saw the same ducklings... I think I counted 9, can you imagine?? I see my friend Petie beat me here... our families were up there for the weekend together. I just saw your comment on thewondersofdoing and had to come over and say hello. So, so sweet! I love that you captured the movement of the water. Thanks for visiting my blog today. What a cute duck family. I just saw your pea pod photo a couple posts below this. Great photography! they are so cute. nice shot. They are awesome! We had a fishpond with wild ducklings on it--about 80 of them one spring! They are adorable. Awwww, I love little duckies ! p.s. great zoom in ! How can you not smile at all that sweetness? Gorgeous photo! Family that stays together, have fun together!